This is one of my favorite Go-To recipes. I almost always have all the ingredients in my stockpile, or enough ingredients to make it, and my hubby loves it. It’s a winner! I make my own taco seasoning for the meat. I like it better than any I’ve found at the store, and I always have the ingredients on hand. Here is my recipe. Add onion, garlic, and jalapenos. When the meat is brown and the onions have a translucent appearance, add the seasonings. Add water and mix thoroughly. Use a bed of lettuce or mixed greens as your base, then add seasoned meat. Pile on your favorite toppings and enjoy! Heat the above in a saucepan til the sugar is dissolved. Add 1/2 c. vegetable oil. 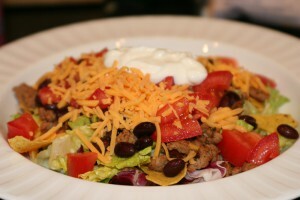 Cool and serve over taco salad. Store in the fridge. Thank you Jill for your Taco Salad dressing. I served it with taco salad at a company lunch without even testing it first – a possible risk, but the ingredients looked great so I took the chance. It is delicious! The tangy-sweet flavor is perfect. Thank you…Sure beats the pre-packaged taco seasoning!! I like Catalina dressing on my taco salad. And I make my own seasoning too, so easy, and no salt like the packaged ones.